The cwf21 family is involved in mRNA splicing. It has been isolated as a subcomplex of the splicosome in Schizosaccharomyces pombe ((PUBMED:11884590)). The function of the cwf21 domain is to bind directly to the spliceosomal protein Prp8. Mutations in the cwf21 domain prevent Prp8 from binding ((PUBMED:19854871)). 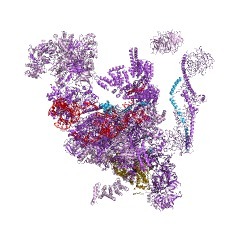 The structure of this domain has recently been solved which shows this domain to be composed of two alpha helices. 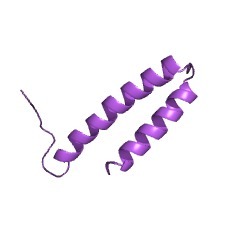 The cwf21 domain is found in proteins involved in mRNA splicing. Proteins containing this domain have been isolated as a subcomplex of the splicosome in Schizosaccharomyces pombe (Fission yeast) [(PUBMED:11884590)]. 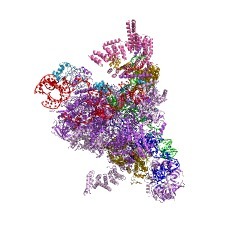 In yeast, this domain binds the protein Prp8p [(PUBMED:19854871)], a large and highly conserved U5 snRNP protein which has been proposed as a protein cofactor at the spliceosomal catalytic centre [(PUBMED:11017191)]. There are 2663 cwf21 domains in 2663 proteins in SMART's nrdb database. Taxonomic distribution of proteins containing cwf21 domain. This tree includes only several representative species. The complete taxonomic breakdown of all proteins with cwf21 domain is also avaliable. Click on the protein counts, or double click on taxonomic names to display all proteins containing cwf21 domain in the selected taxonomic class. Binding / catalysis: Binds directly to the spliceosomal protein Prp8. Physical and genetic interactions of yeast Cwc21p, an ortholog of humanSRm300/SRRM2, suggest a role at the catalytic center of the spliceosome. In Saccharomyces cerevisiae, Cwc21p is a protein of unknown function that isassociated with the NineTeen Complex (NTC), a group of proteins involved inactivating the spliceosome to promote the pre-mRNA splicing reaction. Here, weshow that Cwc21p binds directly to two key splicing factors-namely, Prp8p andSnu114p-and becomes the first NTC-related protein known to dock directly to U5snRNP proteins. Using a combination of proteomic techniques we show that theN-terminus of Prp8p contains an intramolecular fold that is a Snu114p and Cwc21p interacting domain (SCwid). Cwc21p also binds directly to the C-terminus ofSnu114p. Complementary chemical cross-linking experiments reveal reciprocalprotein footprints between the interacting Prp8 and Cwc21 proteins, identifyingthe conserved cwf21 domain in Cwc21p as a Prp8p binding site. Genetic andfunctional interactions between Cwc21p and Isy1p indicate that they have related functions at or prior to the first catalytic step of splicing, and suggest thatCwc21p functions at the catalytic center of the spliceosome, possibly in responseto environmental or metabolic changes. We demonstrate that SRm300, the onlySR-related protein known to be at the core of human catalytic spliceosomes, is a functional ortholog of Cwc21p, also interacting directly with Prp8p and Snu114p. Thus, the function of Cwc21p is likely conserved from yeast to humans. Proteomics analysis reveals stable multiprotein complexes in both fission andbudding yeasts containing Myb-related Cdc5p/Cef1p, novel pre-mRNA splicingfactors, and snRNAs. Schizosaccharomyces pombe Cdc5p and its Saccharomyces cerevisiae ortholog, Cef1p,are essential Myb-related proteins implicated in pre-mRNA splicing and contained within large multiprotein complexes. Here we describe the tandem affinitypurification (TAP) of Cdc5p- and Cef1p-associated complexes. 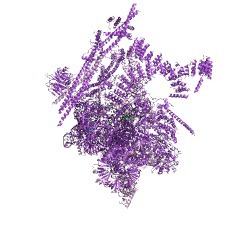 Using transmissionelectron microscopy, we show that the purified Cdc5p complex is a discretestructure. 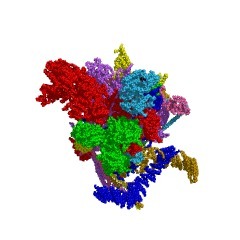 The components of the S. pombe Cdc5p/S. cerevisiae Cef1p complexes(termed Cwfs or Cwcs, respectively) were identified using direct analysis oflarge protein complex (DALPC) mass spectrometry (A. J. Link et al., Nat.Biotechnol. 17:676-682, 1999). At least 26 proteins were detected in theCdc5p/Cef1p complexes. Comparison of the polypeptides identified by S. pombeCdc5p purification with those identified by S. cerevisiae Cef1p purificationindicates that these two yeast complexes are nearly identical in composition. Themajority of S. pombe Cwf proteins and S. cerevisiae Cwc proteins are knownpre-mRNA splicing factors including core Sm and U2 and U5 snRNP components. Inaddition, the complex contains the U2, U5, and U6 snRNAs. Previouslyuncharacterized proteins were also identified, and we provide evidence thatseveral of these novel factors are involved in pre-mRNA splicing. Our datarepresent the first comprehensive analysis of CDC5-associated proteins in yeasts,describe a discrete highly conserved complex containing novel pre-mRNA splicingfactors, and demonstrate the power of DALPC for identification of components inmultiprotein complexes.